A white Aqua Corona Water Feature was the centrepiece of choice for Jane Drew's garden design on the sunny Isle of Jersey. 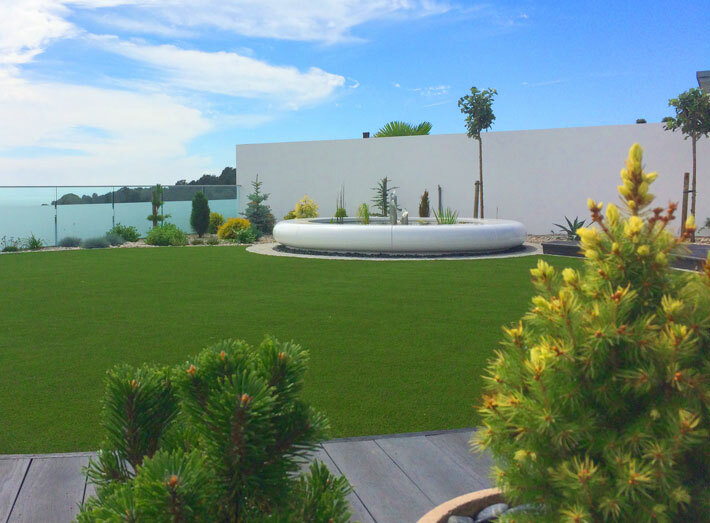 "Our home is situated high up on the Isle of Jersey and has a rocky base so it's very tricky to create a large water feature. The garden offers stunning views over the English Channel and I really wanted to create something spectacular to suit the setting. I re-designed the garden myself as it was just dried grass when we bought the place. I wanted to hear the sound of running water whilst I was in the garden as I find it very soothing, but I didn't want a waterfall. I also wanted to attract wildlife into the garden so a pond seemed the ideal solution, but I wanted the feature to have a very contemporary feel." "I was searching online and discovered GeoMet and I absolutely fell in love with the Aqua Corona Water Feature. It was perfect and I had to have it. Naturally there were a number of issues importing such a large structure onto the Island. Fortunately the water feature is modular in construction and handcrafted, composite moulded, which makes it extremely hard wearing, but it still had to undergo transportation via ferry, winching onto a delivery truck and installation on site. GeoMet were extremely helpful throughout the whole process, especially Wayne, he was fantastic. 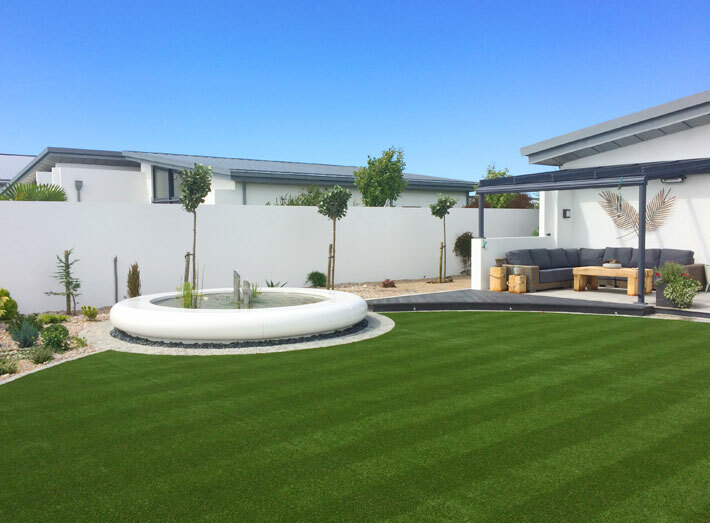 We were away when the water feature arrived, so I left it in our landscape gardener's capable hands to install the piece in our garden." "I love my new water feature. I look through my windows and the water feature takes pride of place in my garden, it really has created a stunning centrepiece. I added an aluminium sculpture to the centre of the water feature and all my friends and family have admired the finished piece. Thanks to the flat top to the water feature it's ideal to sit upon and is a great place to entertain for drinks. Our house is white and the stark white of the pool really completes the garden – and I know I'm the only house on the Island with an Aqua Corona Water Feature." The Aqua Corona Water Feature is 4m in diameter and is available as a full circle or semi-circular construction. Designed for commercial and residential use, either indoors or outside; the GeoMet range offers fantastic flexibility in space planning, whilst also providing an alternative to traditional timber, aluminium, PVE and plastic furniture. 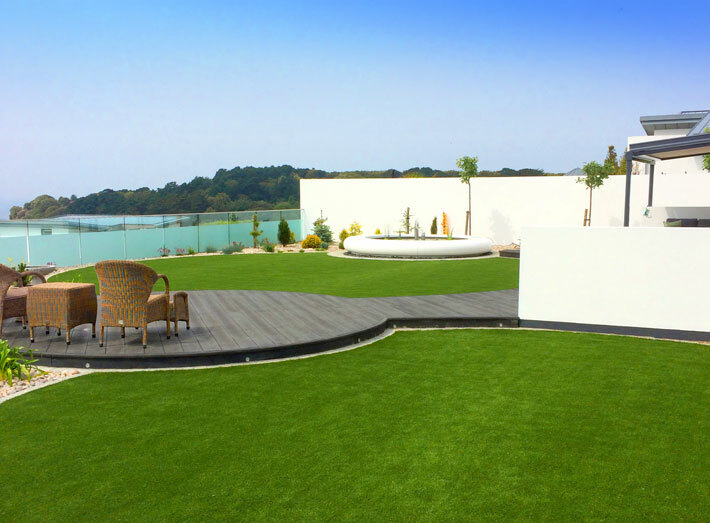 Available in a wide range of colours and environmentally friendly, GeoMet is also exceptionally durable, weatherproof and requires minimal maintenance whilst offering maximum visual impact. 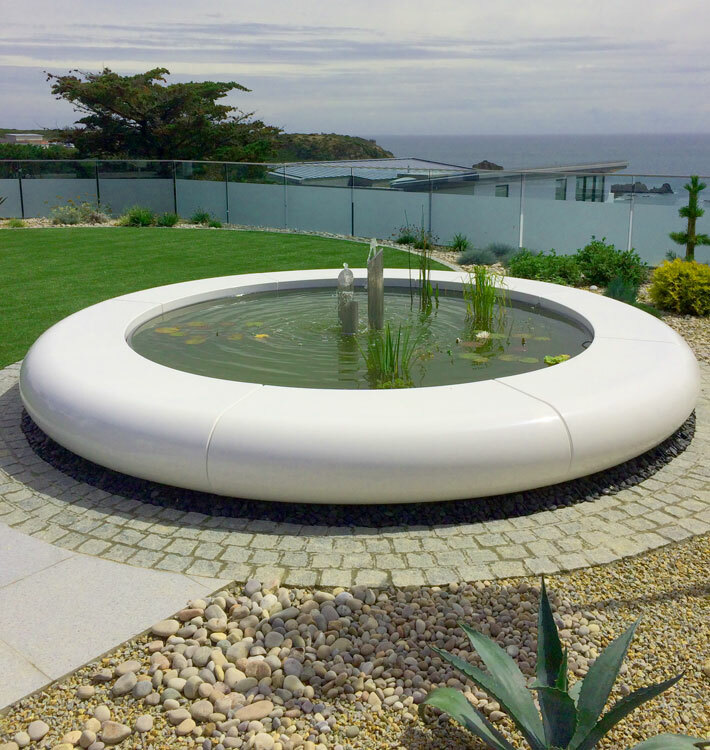 A white Aqua Corona Water Feature was the centrepiece of choice for a landscape garden design on the sunny Isle of Jersey. Designed for commercial and residential use, either indoors or outside; the GeoMet offers fantastic flexibility in space planning. Thanks to the flat top to the water feature it's also seating and is a great place to entertain for drinks. 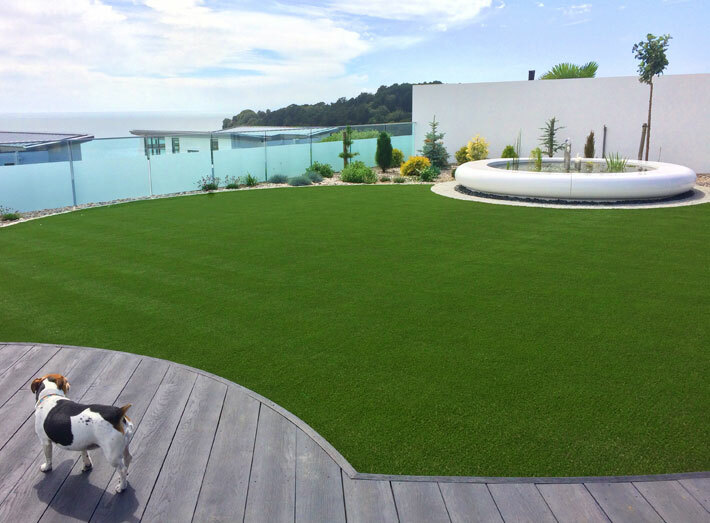 Available in a wide range of colours, GeoMet is also exceptionally durable, weatherproof and requires minimal maintenance. "I was searching online and discovered GeoMet and I absolutely fell in love with the Aqua Corona Water Feature. It was perfect and I had to have it. Naturally there were a number of issues importing such a large structure onto the Island... it had to undergo transportation via ferry, winching onto a delivery truck and installation on site. GeoMet were extremely helpful throughout the whole process..."
Open 8.30am to 5.00pm Monday to Friday.